Staff doing a light dusting on greens. This is done three times a month during the warmer months from (June-Aug) The light dusting help reduce stress compared to the medium rate topdressing that we do during the spring in fall. The heavier topdressing requires us to use a pull behind unit. 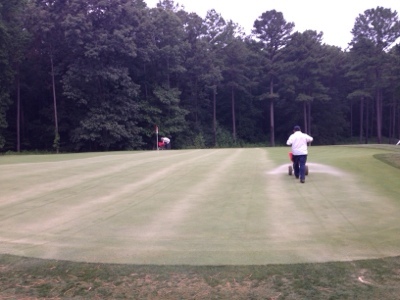 The topdressing helps with firmness, thatch dilution and algae control. 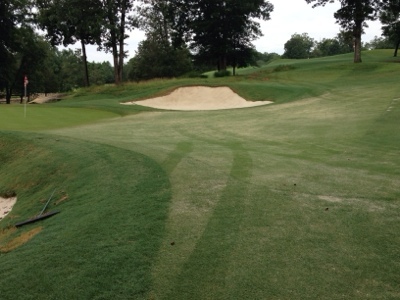 Here you can see the light topdressing we do every other week in the approaches during the summer. This is completed with a less expensive sand since these areas takes about 20 tons for one application. We do the approaches to help with firmness and smoothness.